Welcome to the Castlecourt Hotel Resort, one if Westport’s favorite and best known hotel, the ideal venue for your Hen Night. The beautiful and welcoming 4-star Castlecourt Hotel is located in the heart of Westport. The stylish Orchard Restaurant serves fine Irish and continental cuisine whilst the Courtyard Bistro light lunches and pastries throughout the day . The popular Petie Joe’s Bar offers a wide selection of drinks, cocktails and live music every night. The leisure centre offers FREE 20-metre indoor heated pool, sauna, steam room, jacuzzi and gym. 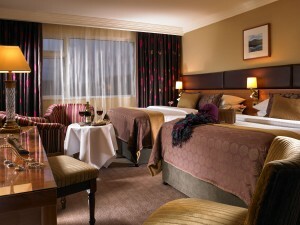 The classically designed spacious rooms at The Castlecourt Hotel offers all the luxuries a girl could ask for when away. With an outdoor rock pool hot tub, the luxurious Spa Sula offers a range of massages, body wraps and beauty treatments. Westport Train Station is a 10-minute walk from the hotel. Spa Sula is a spacious, tranquil sanctuary which is designed for you and your friends to relax and luxuriate in. For bookings and further info, please use the details below.